Get cash for your junk car in New Mexico today! We provide the fastest cash for junk car service in New Mexico. You'll be paid right on the spot by one of our awesome New Mexico junk car buyers. Just East of the Carson National Forest in New Mexico sits the ancient town of Taos Pueblo. Its residents have inhabited this small dwelling for more than 1000 years! If that old junk car you have sitting in front of your house looks like it’s older than Taos Pueblo itself, perhaps it’s time to think about selling it to a junk car buyer. Luckily The Clunker Junker pays cash for cars in New Mexico! Whether your car doesn’t run and looks like it was involved in an atomic bomb test, or is just lightly used and you need to sell it quickly, we will buy your car for cash and pick it up for free all across New Mexico! The hot desert air and large percentage of unpaved roads in the state can take a real toll on your car. Paint will fade from the sun and be chipped by flying gravel. The high elevation and thin air means your car’s engine has to work harder, possibly reducing its life span. The same natural elements that make New Mexico so charming and unique also make keeping your car looking and working its best more difficult. When your car finally kicks the bucket, call The Clunker Junker. We buy junk cars in New Mexico and pay top dollar! Famous for UFO sightings and crashes, New Mexico has a rich history with extraterrestrials. If you happen to have a crashed or wrecked space ship in your back yard, we’ll be happy to make an offer on that as well. Just don’t tell the government! And if you’ve ever tried to sell your junk car to a private buyer or New Mexico junk yard, the experience might leave you feeling like you want to don’t want to live on this planet anymore. Sell your junk car in New Mexico to The Clunker Junker Instead, we’ll treat you right and pay top dollar. Our cash for junk cars service in New Mexico is out of this world! In order to sell your junk car in New Mexico, you’ll need to know a few things about your old junker before it can be towed away. First, the basics: tell us the exact year, make, and model of the car you wish to junk. This clarification will give us a general idea on how much we can offer you before we get to the nitty-gritty.Even if your ride isn’t exactly road-ready, there’s no need to worry: we still pay top dollar for junk cars in New Mexico. Once the details are entered our software will generate an instant offer for you in most cases. If you like the offer we’re giving you, just click “Accept.” After that, we’ll go about the business of connecting you with our junk car removal specialists in New Mexico and schedule a time for pickup. After you accept our cash offer, we’ll schedule your vehicle for pick up within three working days in many cases. When the junk car removal specialist comes knocking on your door, he or she will give you your cash or check payment for your keys, title (if required), and vehicle. Towing is free, so you can rest easy knowing there are no hidden fees. You can sell your junk car in New Mexico for a lot of money! We buy junk cars in New Mexico, and virtually every junker that comes our way is accepted as long as all the parts are there. However, we do separate our junk cars into three separate groups when we figure out how much to offer you. The rusted-out-and-beyond-repair cars make up our first sorting group. These cars have seen far better days, and because of this will probably be recycled by New Mexico junk car buyers and junk yards for raw materials, so size and weight of the vehicle will determine the price. You might expect anywhere from a $50 to $200 cash amount or check from us before we take it to an auto salvage yard. But if your car isn’t necessarily rotting away at the shocks, then it’s what we call an “in-betweener.” These cars might need a few repairs to get back on the road, or at the very least still, have usable parts. We usually can’t give an exact price on these right off the gate, but we’ll offer you more than those in our first category. If you’re still doing the school run in your so-called junker, then congrats: you have what we call a “This car isn’t junk!” kind of whip. For cars like these, we may offer you anywhere from $200 to $10,000 for it. We have put together a simple guide and example for how to sign your New Mexico title when you are selling your vehicle. If there are multiple owners listed on the title, they must all sign the title unless the names are separated with "OR". Towards the bottom of the front of your New Mexico title is where you'll want to sign and print to transfer ownership. 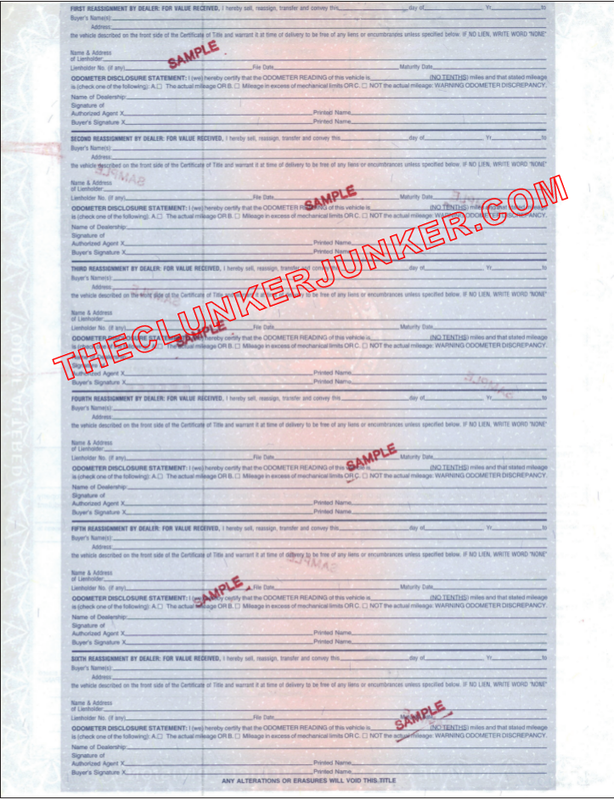 Make sure you sign as a seller and not a buyer, and don't write anything on the back in the dealer assignment sections. First sign the front of the title where indicated by "Signature(s) of Seller(s)" (see image). Print (don't sign) your name on the front of the title where it reads "Printed Name". 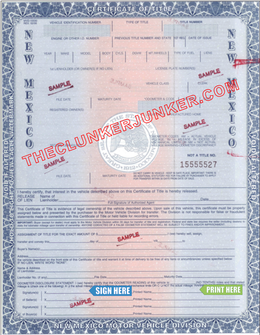 Fill out the New Mexico Application for Duplicate Certificate of Title. Bring your duplicate title application to your local MVD location. Please note that there may be a two to three week waiting period before a duplicate title can be issued and the cost is $16.50. (Paid to the NM motor vehicle division). Getting rid of an abandoned vehicle in New Mexico can be a difficult process. Unfortunately, you cannot just sell any junk car that ends up on your property if you do not own it. You'll need to follow the New Mexico abandoned vehicle removal procedures. We have given a general overview of what that entails below. To have an abandoned vehicle removed from your private property, you must first contact your local law enforcement office. A person or company may claim an Abandoned Vehicle Lien on a vehicle that was abandoned on their property for at least (30) thirty days. If the vehicle is more than (8) eight years old, it may be disposed of by a licensed dismantler. If the lien claimant chooses to sell the vehicle and it is more than (8) eight years old, the lien claimant must follow instructions on titling through the lien process. If the vehicle is less than eight years old, is repairable, or if the property owner wishes to retain it for his own use or to sell it, the property owner must proceed to make claim for the vehicle through the abandoned vehicle lien process to obtain a title. Can you buy cars in New Mexico without title? Only under limited circumstances. We certainly cannot purchase every vehicle that is submitted to us without title. There are certain restrictions such as age and location, and it’s ultimately up to your local buyer. In the cases where we can purchase without title, the offer will be substantially less. New Mexico often changes their title documents from year to year. If you have questions about your specific title, please contact your New Mexico MVD. You should complete the notice of vehicle sold form and return it to your local MVD office. At The Clunker Junker, we pride ourselves on giving our customers top dollar cash for their junkers in New Mexico, no matter what condition they’re in—good, bad, and everything in between. Get in touch with The Clunker Junker today, and get the cash you need ASAP! "The driver side-view mirror is missing. The car runs, but the battery is dead at this moment. It takes a little wiggle to start the ignition. 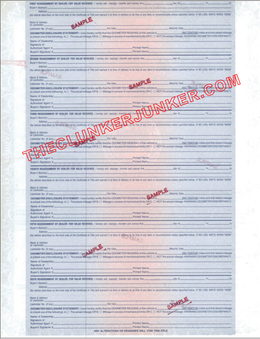 I couldn't afford the insurance and had to turn the plate in which are the reasons for junking the vehicle." "This car has a clean body, and the engine was running fine last time I drove it. I had to go away to school for four months, and the car was left parked outside where, apparently, via a previously unknown leak, rain was able to get into the car. The interior has extensive water and mold damage. My guess is that the battery is currently dead, since it hasn't been driven in months, but I haven't tried to start it because there is too much mold for me to feel comfortable getting into the car. I am now moving, and I need to junk the car for some cash fairly quickly." "I have put more than $500 into this vehicle. It has a new water pump. It has new wires, cap rotor and plugs, new rear brake drums, brake shoes and spring kit on both sides. It has new wheel cylinders in the rear and new window motors on both sides. It has new door handles (driver side is installed, passenger side needs to be put in, but I do have it). It has new window switches and a new heater control panel. It has new rotors and hubs in the front on both sides. It has a new starter. I replaced the battery cable down to the starter. I rebuilt the transmission two years ago. It has new air shocks. Most of this is within the past five months." "The truck is from out of state. It has rust on most of the bottom of the truck. The brake lines are rusted out. The engine will run with a new battery. It's been approximately one year since it was last running. I was going to replace the body panels but do not have the time. The interior is clean and intact." "The starter motor has failed. The engine ran fine, and the car drove when the starter motor last worked. You will not be able to drive it away, but it would drive with a starter motor." "This car was stolen and just recently found. I have been told that the tires are all slashed, and the windows are all broken. That's all I know about it right now. When it was stolen, it ran very well, as it had a decent engine in it." 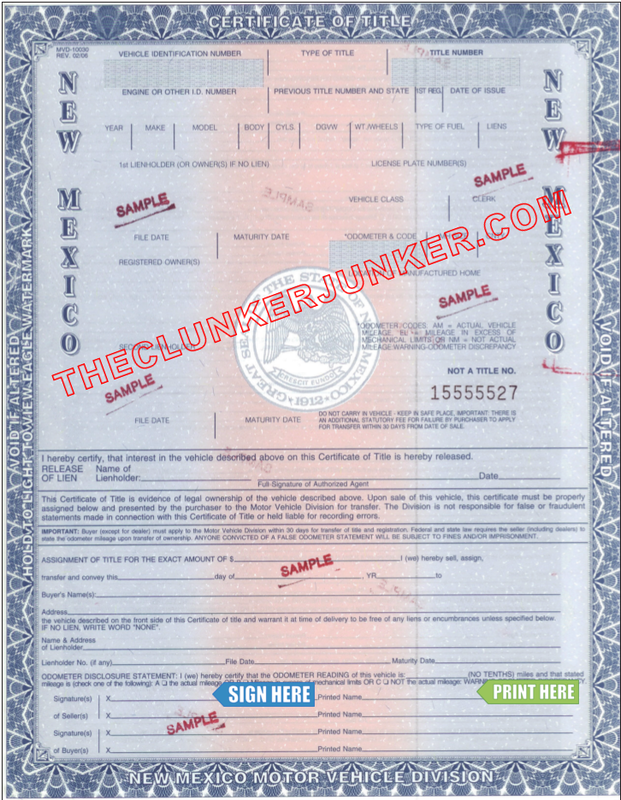 The Clunker Junker is one of the top junk car buyers in the state of New Mexico. To date we have made instant offers on over 6 thousand vehicles across the state, totaling over $1.8 Million offered! Of those vehicles, approximately 4% were purchased without a title. We also buy cars on a wide spectrum of conditions and 63% of the vehicles we've made offers on in New Mexico do not start or drive. Many also have moderate to severe body damage. Albuquerque in Bernalillo County was our top producer, followed by Las Cruces.